The odd little fridge in my VW runs off of electricity, or propane. It seems not to care if you are using supplied electricity, its own alternator, or the propane, the cooling fins inside the cold box get cold but didn't cool the box down. Problem is, very little air moves around them and it takes a long time for the cooling element to chill the contents of the box. Adding this small, and very quiet fan made all the difference in the world. The fan moves air around in the box, and everything gets to a pretty even level of cold. I need to be sure not to over fill the fridge, and to leave room for air to move around. The fan doesn't blow very strong, but it'll keep the air moving enough for the cooling fins to do their job. I suggest removing the charcoal filter packet, as it just seems to restrict flow. Thanks to this little fan, drinks are now cold. 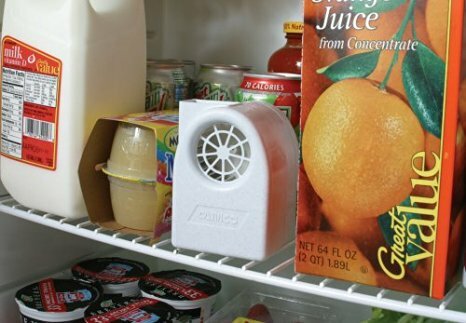 I still keep meats and dairy in a cooler with ice, but this simple fan turned my fridge from storage for dry goods into a refrigerator.